Light Sword handle styled from Star Wars films. Sword blade automatically extends when switch is activated. Switch also activates sword tube light. Styled like the Rifles used by Stromtroopers used in Star Wars films. Two triggers activate different electronic laser sounds. 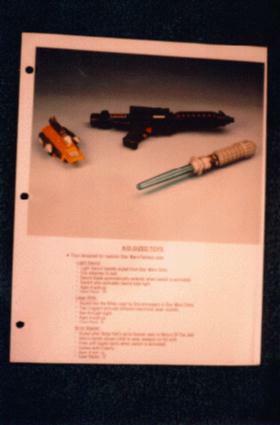 Styled after Boba Fett's wrist blaster seen in Return of the Jedi. Velcro bands [allow] child to wear weapon on his arm. Fires soft tipped darts when switch is activated.